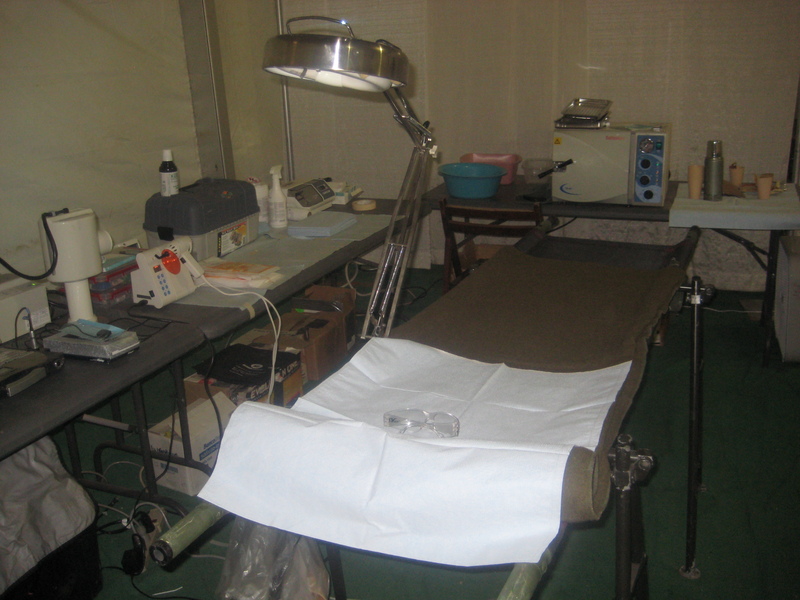 Dentists assigned to a brigade will no doubt get the opportunity to do one of two rotations – NTC or JRTC . These rotations are approximately one month long and are designed to simulate being deployed to either Iraq or Afghanistan. My brigade just completed a month-long rotation at NTC and I was privileged enough to go along for the whole ride. I heard all these horror stories from folks about NTC so I was a little concerned going into it. It really wasnt that bad. Here is my NTC story: We left Hawaii on a chartered Delta 747. It was just like a normal 747 except it was full of soldiers and guns. 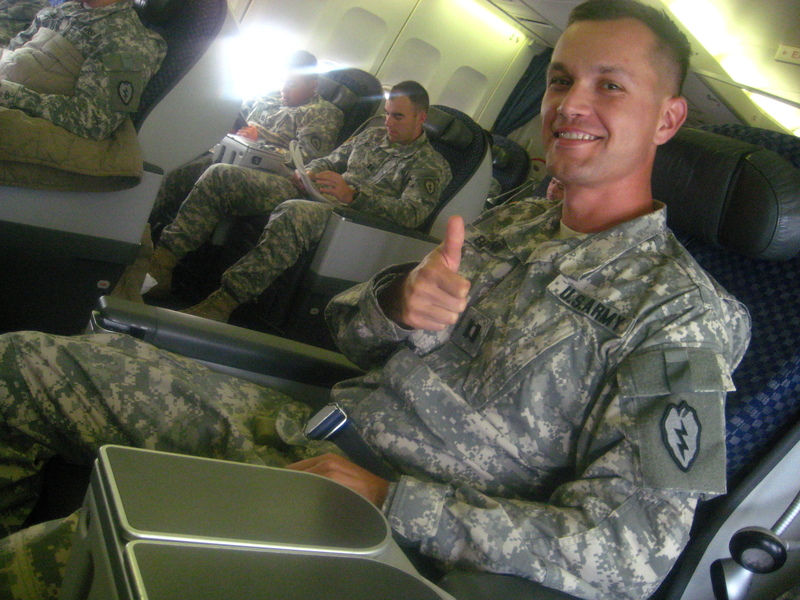 They took everyone E-7 and above and flew us first class. That was awesome. We flew straight from Hickam AFB to this tiny desolate place called Victorville, CA. It used to be George AFB back in the day but was closed in 1992 as a result of the BRAC. We landed just before midnight. 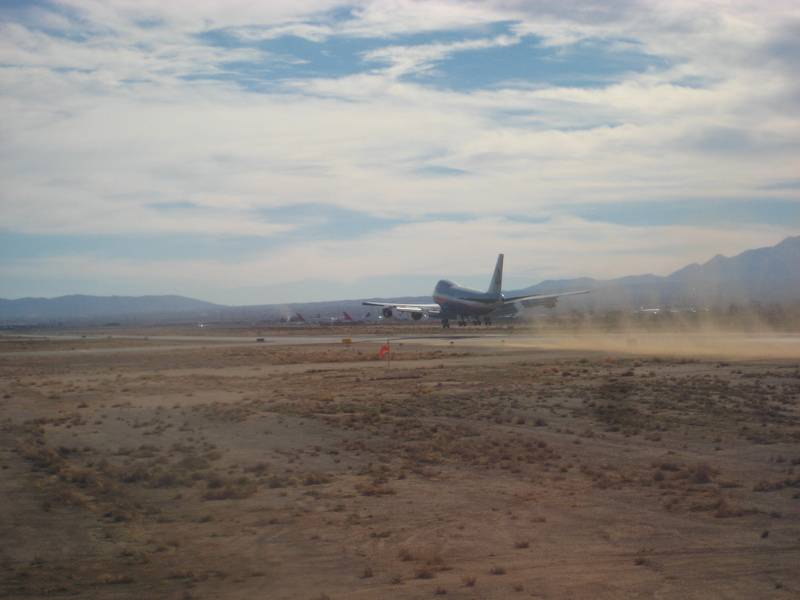 They wheeled a staircase up the side of this giant aircraft in the desert and we just deplaned right there. It was a little weird hanging out underneath the wings of this giant craft that just ferried us across the ocean. They gave us 15 minutes to smoke and use the latrine then herded us on to busses for the journey to Ft Irwin. We arrived at LSA Warrior AKA the Rotational Unit Bivouac Area (RUBA) around 0200. We stood around outside for about 45 minutes while they unloaded our bags, gave us briefings on where we were, and told us where we would be staying – giant tents that held about 150 people. We spent about a week in the RUBA. The living conditions weren’t really that bad. We had a PX, Burger King, laundry facilities, and the infamous “Gut Trucks” that served the cheapest and most delicious coffee on post. There were showers, flushing toilets, and a dining facility that served hot food even though it was outdoors and standing room only. Our soldiers spent the week getting weapons and vehicles ready for the rotation. The docs ran sick call out of a trailer and I had to take any dental patients to the main clinic on post to treat them since we didnt have a field clinic set up yet. 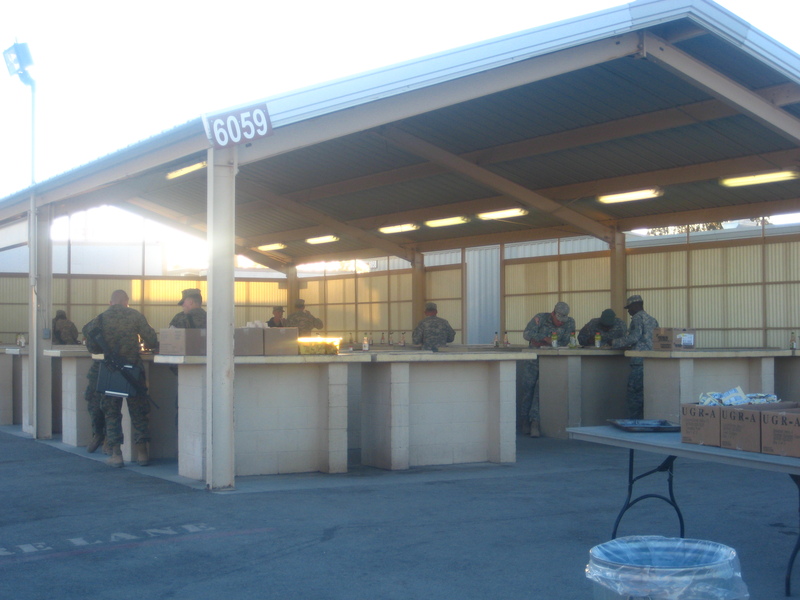 The Ft Irwin DENTAC was very accommodating and they were all extremely helpful and friendly. I saw about three patients that week. The rest of the week was spent sitting on my rear. After the week in the RUBA we convoyed out to “the box” for our two weeks of training. The Box is a training area roughly the size of Rhode Island. It is designed to look and operate just like Afghanistan or Iraq. There are multiple Forward Operating Bases (FOBs) scattered about as well as multiple little villages. During those two weeks the brigade conducted full spectrum operations. They ran convoys, attacked insurgents, got attacked, etc…Our job at the clinic was to run a level two medical facility to treat all real world and “notional” casualties. 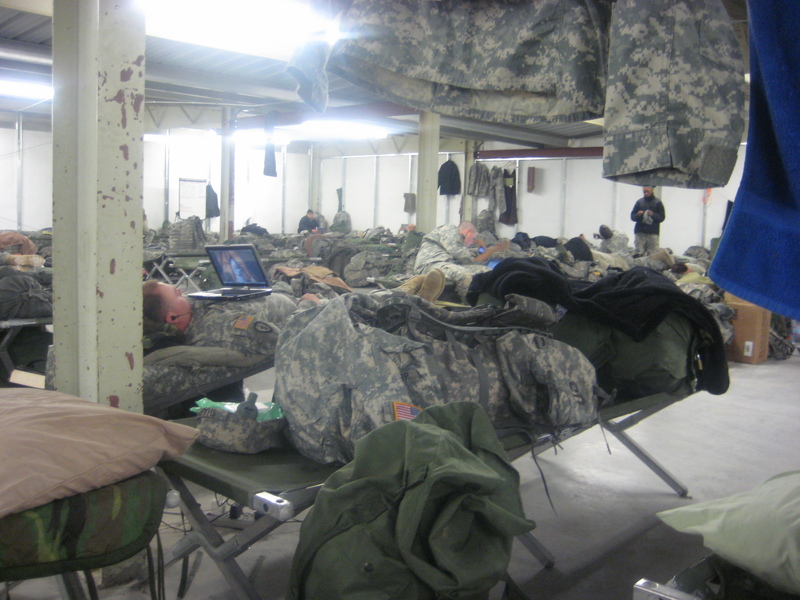 When we got to the FOB that first night we had four hours to go from tent with dirt floor to fully operational medical facility. The living conditions were austere – no real toilets, no running water, no PX. It took three days to get the shower tents up and running. We ate a lot of MREs those two weeks. You aren’t allowed to take cell phones into the box (although I did) and there is no internet access. Verizon gets good service but nothing from AT&T. The soldiers at the other FOBs would get attacked by fake insurgents. They would then be flown to our facility for “treatment.” We would triage them, treat them, and evacuate them. We saw 305 pretend casualties those two weeks. The cadre at NTC employs amputees to play wounded soldiers and they do a pretty damn good job acting the part. It was a real eye opener for our new medics – most of whom have never actually seen any blood or trauma. After two weeks of life in the box we headed back to the RUBA – convoy style. We convoyed several hundred vehicles about 6.5 miles back over a period of HOURS. You can’t head west at sunset very fast through the desert. We got in late at night and moved back into the tents we were originally in. We spent the week doing pretty much nothing. Our soldiers stayed busy cleaning weapons and vehicles. The officers, however, were relegated to wander the main post of Ft Irwin like vagrants. We spent hours loitering at the PX, bowling alley, and library. I really felt homeless. After a week of that we headed back to Hawaii. So overall NTC wasn’t the worst experience I have ever had. It sucked being away from the family but I really think it was a great learning experience for everyone in the unit.